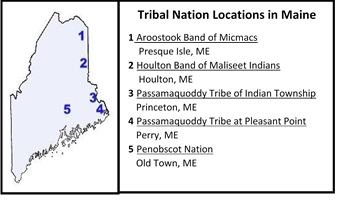 Maine is home to five federally recognized tribes. Each tribe has an environmental science office with a professional team that works closely with the tribe’s elders to maintain the nation’s natural resources and plan for the future. In this endeavor, the five tribes in Maine frequently collaborate with each other and with the staff at EPA Region 1. This article summarizes the MIT CEHS COE2C’s growing engagement with the Native American community after listening to their environmental health concerns raised earlier in previous conversations. The three projects demonstrate our responsiveness to community needs, primarily focused on effective teaching tools for youth groups and assistance in managing instrumentation and analyzing environmental air quality data. Over the past two years, the MIT CEHS COE2C Director, Kathleen Vandiver, has become more familiar with the New England’s tribal environmental issues through monthly teleconferences with the Regional Tribal Operations Committee (RTOC) in EPA Region 1. These interactions led to an invitation to participate in the New England EPA Tribal Environmental Summit entitled “Preparing the Next Generation of Tribal Stewards for Emerging Environmental Challenges” held in October 2015 in Presque Isle, Maine. The Summit was hosted by the Aroostook Band of Micmacs with tribal leaders from all over New England and by EPA Region 1 senior leadership. The MIT CEHS faculty member, Professor Noelle Selin, presented a talk on “Global Mercury Modeling and Implications for Local Communities.”, It was the first time many tribes had heard a mercury expert provide concrete data showing that it will be many generations before the tribes in New England can safely return to their traditional fish diet for sustenance. In addition, MIT COE2C’s materials “A Learning Table for all Ages: Understanding Air” was presented at the conference. Vandiver was assisted by two MIT students as they led high school youths through activities that explained the chemistry behind climate change and air pollution. The Wabanaki Youth Science program is an educational program that integrates modern technology, science, and Traditional Ecological Knowledge (TEK). This program, which began in 2013, was created by Professor Darren Ranco at University of Maine, Tish Carr, a natural resources professional, and Barry Dana, a WaYS cultural knowledge keeper who is a Penobscot community elder and former tribal chief. This program offers three features: a week-long summer camp; a high school internship with a tribal environmental program; and an after-school program with TEK for middle schoolers at a local teen center. This program helps youth persist in studying science as well as to continue their legacy as first stewards of the earth. Vandiver led two training sessions for WaYS educators in the fall of 2015, one in South Portland, Maine and another in Orono, Maine. The MIT CEHS donated two hands-on classroom sets for two different lessons. One of the sets uses model fish with chromosomes that animate the relationship between genes and traits. The second set teaches chemistry with bricks as atoms to illustrate how atoms behave in chemical reactions. The reactions can lead to larger insights such as how carbon cycles in nature and the role of forests in sequestering carbon. On August 2015, Vandiver, Nancy Dalrymple, and John Essigmann (MIT CEHS Center Director) met with Maine Indian Education (MIE) leaders, Beth Clifford and Dana Mitchell, at the Wabanaki Culture Center on the banks of St. Croix River. After Vandiver presented the COE2C materials, she was invited by Beth Clifford to lead two professional development workshops for their teachers. Vandiver returned to Calais, ME again in mid-November 2015 to present the two workshops using the CEHS donated MIT Edgerton Center Molecule Set. One teacher was eager to share the set with his class the next day!